Crete is the Mediterranean’s fifth largest island; the distance between its eastern and western ends is about 250 km, equal to the distance between London and Exeter. Normal ferry connections between Heraklion and Piraeus take about nine hours but the journey can be done in less than six hours using new high speed vessels. Chania and Rethymno also have ferry services to the mainland. The island has several mountainous ‘massifs’ and two peaks at about 7,500 feet so snowy vistas appear in winter. As well as being generally warmer, the southern coast of the island has less seasonal variation than the north. The island receives about 470,000 UK tourist visits a year. Crete has numerous Blue Flag beaches. There are no restrictions on foreigners buying property on the island. One particular consideration for investors should be the outline plans to build a container port at Tympaki in the south of the island. Given that a key attraction to Crete is the relaxed lifestyle of the Cretans, it seems a shame to cut oneself off from them by buying in developments that are too self-sufficient or distant from existing communities. In fact most developments seem to be quite small-scale rather than imitating the well publicised Aphrodite Hills resort on Cyprus. As well as new developments there are plenty of older properties for sale. There are also some parts of the island with heavy concentrations of expatriates and this has implications for prices and lifestyle. There is a huge range of prices but investors probably need to factor in substantial renovation costs at the lower end of the market. Speaking personally, an above average proportion of property photos fail to convey the charm or essence of the locations. For those considering investing with holiday lets in mind, it’s all the more important to consider accessibility. Despite the attractive climate, the distance from the UK means that the tourist market is strictly seasonal and the rentals quoted on holiday websites for short lets are not indicative of annual rental income. Expatriate settlement has tended to concentrate on the western end of the island up until now with the areas around Chania and Rethymno being particularly popular but there are also expatriate communities around Heraklion and Lassithi. Rethymno in particular seems to find favour as a centre for expatriates because of the attractiveness of its historic centre. However, the best investments may be in Eastern Crete where residential property prices are 30 to 50% lower than at the western part of the island. Sitia is another attractive port town (with a ferry connection to Piraeus) . 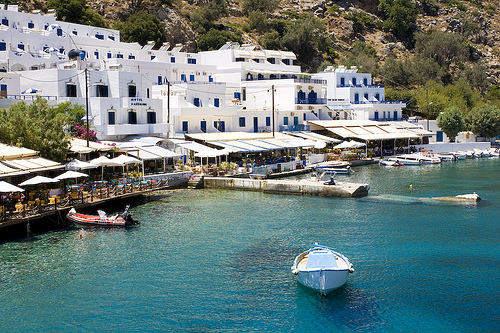 beyond Sitia is Makris Yialos which possesses tourist facilities, good beaches and traditional houses.